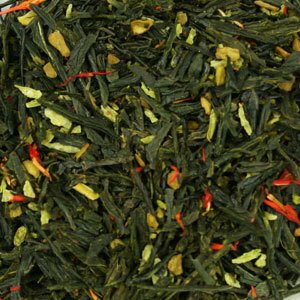 Chinese Sencha Green Tea, marigold petals, cornflower petals, fruit pieces, flavor. This is a delicious tropical tea. 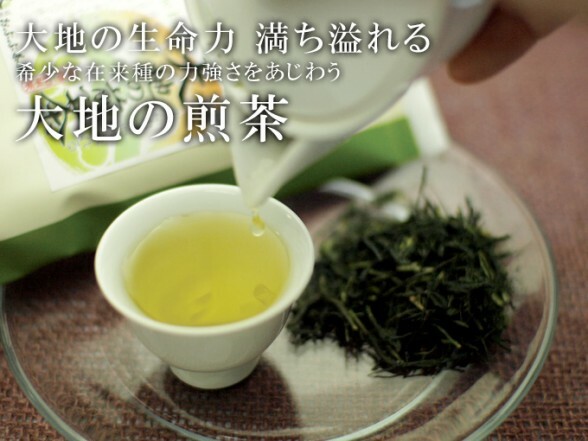 It is flavored lightly so the green tea is the primary focus of this cup, and that’s the way it should be. The green tea is a Chinese Sencha and it is light and buttery. The creaminess from the butter taste lends itself well to a smooth, silky mouthfeel that lingers well into the aftertaste. It is not astringent. It has a mild sweetness to it that melds well with the fruit flavors. The description does not go in to detail about the tropical flavors that are used in this blend, but, I can detect a pineapple note. It is very much a seamless fruit flavor – like a tropical superfruit. I hesitate to call it “tropical punch” because this tea is in no way like punch. 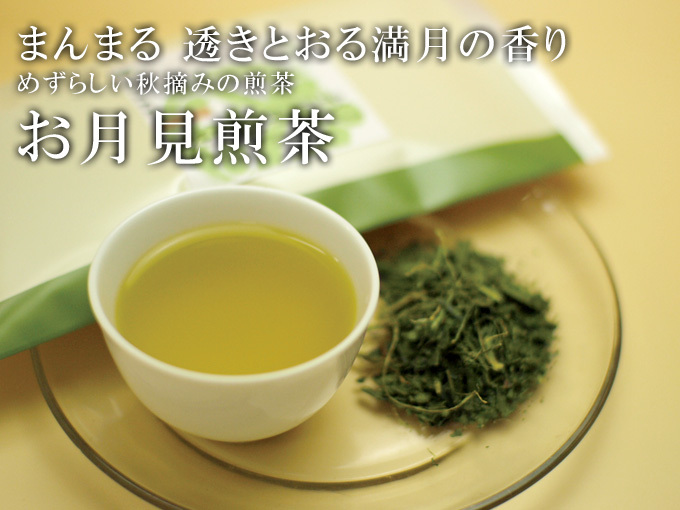 This is green tea gently flavored with a tropical essence. However, you know how when you drink tropical punch, it is difficult to discern which fruits are in there? In that way, this tea is similar. The aftertaste is sweet with a hint of tartness that tickles the tip of the tongue. This is nice served hot, but it is spectacular served iced! A delightful summertime refreshment! Gen Mai? Lemongrass? Chai? I can’t say as I would have thought about putting all of this together but I am sure glad that Yogic Chai did because it’s pretty darned awesome! 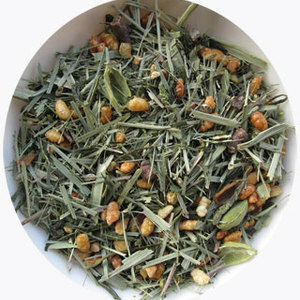 The Genmaicha is the perfect ‘strength’ for me and of really good quality. The Cardamom, Cinnamon, Cloves, Ginger are all quite subtle and I’m completely fine with that. There are little popped rice that are included in this blend of flavors and I think that is very nice! It makes me smile, actually! The Lemongrass is a wonderful touch! This is another good, unique chai/blend from Yogic Chai! And I am grateful that I was able to try it. If you have the opportunity to sample it – do it! You won’t regret it! Balancing sweetness with bitterness, the Sencha of the Earth or 大地の煎茶, was named because it comes from standard tea plants over 30 years old. The strength of these plants is simply amazing, and we can feel the power of the earth as we drink it. Grown on northwest facing slopes near the Wazuka River. Another fantastic Sencha from Obubu Tea! 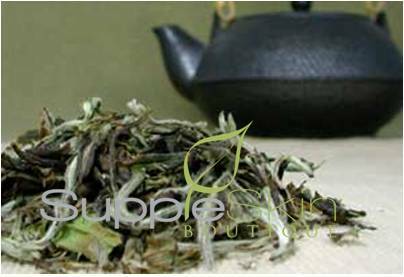 It brews to a pale green that is much more translucent than Obubu Tea’s Sencha of the Autumn Moon that I reviewed previously. It possesses a slightly nutty aroma with a hint of spice in the background, and a vegetable front note. This tea tastes so fresh and vibrant, like a run through a dew-drenched meadow of clover on a sunny afternoon. There are strong notes of vegetation that are a little more grassy than vegetable, and unlike some Sencha teas I’ve encountered, I don’t get that heavy buttery quality. There is a note of creaminess, but it is more like creamed spinach than it is creamy butter. This tea is appropriately named, because there is also an earthy quality to the flavor of this tea that I don’t think I’ve ever experienced before with another Sencha tea. With this earthy note and the aforementioned grassy tones, this tea truly is a Sencha of the Earth! This Sencha is delicious hot or iced, but I recommend trying it first as a hot tea so that you can fully appreciate all of the subtleties that this tea has to offer, because as it cools some of the flavors mute slightly, and this becomes much more vegetal-tasting than it is hot. One thing worth mentioning, though, is that as it cools, I notice more of a gentle pepper-y taste in the background that is quite delicious. Regardless of how you choose to serve it, you should definitely try this tea! Otsukimi (お月見) literally means “moon viewing” and is closely associated with Japanese festivals celebrating the moon in Autumn. It is at this time of the year when the moon appears brightest, and Japanese eat certain dishes such as tsukimi dango (round, white dumplings), edamame (soybeans), Japanese chestnuts, etc. Our Otsukimi Sencha or Sencha of the Autumn Moon was named after this Japanese tradition not only because we harvest it in late September when the festivals occur, but also because the tea leaves and stems produce a bright yellow-green sencha with a round flavor. On the flavor guide for this tea on the Obubu Tea website, it suggests that the aroma of this tea “reminds you of a full moon.” Now, I don’t know if the aroma actually reminds me of a full moon, or if the mere suggestion evokes the image, but, I will say that the aroma is a pleasant one. Vegetative, but with notes that do remind me of the scent of the evening air on a clear night: the trees, the crisp breeze, and hints of flower in the distance. So, perhaps it does remind me of a full moon, or at the very least, a cool evening in autumn. The tea brews to a rather murky shade of green, not an unpleasant color, but not the bright green that I often achieve from brewing a Sencha tea. But do not let that sway you, because the flavor is delightful. It is rich and vegetative with a nutty undertone. There is an intriguing bittersweet flavor to this cup. Not a bad “bitter” – but a savory one that perks the taste buds right up and calls upon them to take another sip to experience the taste yet again. The taste is very fresh and slightly grassy, which is something I’ve come to expect from a good quality Sencha such as this, however, this one doesn’t possess that sweet butter taste of some other Sencha teas, this one is more of a bittersweet kind of Sencha, making this an ideal choice for those who find that buttery feel and taste a little off-putting. The finish offers a very light astringency. The aftertaste is clean and lightly sweet with hints of flower and grass. The tea has a very well-rounded flavor; very palate pleasing! Overall, a very enjoyable cup of Sencha! 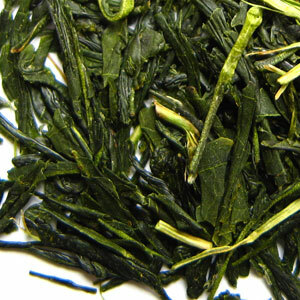 This is the most rustic tasting Sencha in our catalogue and it comes from Mister Iwata, of the Nara region, who is a small-scale organic producer who does everything himself, from cultivation to final transformation. He picked the leaves in early spring, choosing to avoid the harsh selection process that Sencha teas usually go through. The result is a visually irregular tea of surprising complexity: mild, bright, and thirst-quenching. As for the aromatics, there are vegetal (lamb’s lettuce and spinach), sweet (wheatgrass) and oily (nuts and cashews) notes with a lovely lingering floral (lily) finish. First of all, it requires a longer steeping time than with typical Japanese Sencha teas (which are usually somewhere in between 30 seconds and one and a half minutes) to achieve full flavor (this one requires a minimum of three minutes, and my most recent infusion I steeped for four minutes). The first time I attempted to steep it, I steeped it for a minute and a half, and it tasted a bit like hot water with very little green tea flavor. So, do yourself a favor and steep this one a little longer than you might with another Japanese Sencha – your diligence will be rewarded! Because the flavor is very pleasant. It has a very pleasant vegetative essence – one of the most pleasant I’ve ever encountered! It has a mild buttery taste with a flavor that is somewhere between crisp butter lettuce and steamed spinach. 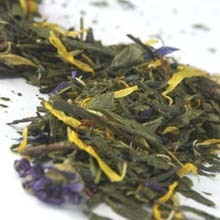 It is a light-bodied tea with a vibrant, refreshing flavor. Just like the product description suggests, I even get a slight bittersweet wheatgrass taste from this – but it is ever so slight – and a floral finish that charms the palate. There is an invigorating astringency to this tea that I’d categorize as medium. The astringency isn’t drying though, it comes off as more citrus-y tart to me than drying or cleansing. This is a green tea that would take very nicely to an addition of thinly sliced citrus fruit, if you happen to have some on hand! I really enjoyed this truly different Sencha. If you enjoy Japanese Sencha teas, this is one I’d recommend for a little variety – it is wonderful!